Three love stories in three different eras (1966, 1911 and 2005) in Hou's characteristic, philosophical and aesthetic style. The different couples are each played convincingly by Shu Qi and Chang Chen. A blessing in disguise. The film was planned as a trilogy to be made by three directors. When the production could not be completed, the Taiwanese master decided to make all three parts himself. As a result, Hou forced himself to film three different stories in three different ways, so the viewer is treated to an unparalleled display of versatility. The three stories are situated in three different periods. And each time, Shu Qi and Chang Chen play the female and male leads in a tragic love story. 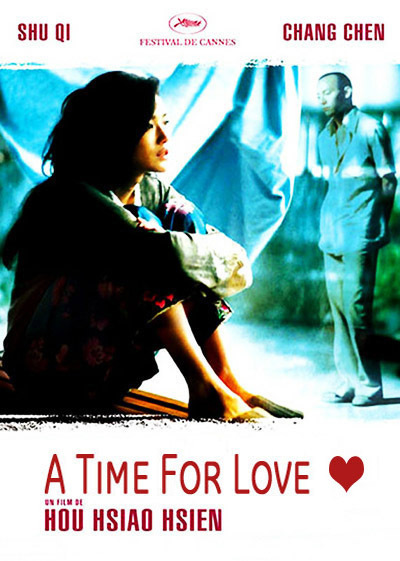 The first part, A Time for Love, is closest to Hou's previous work and is set in the 1960s, in his youth. It is a very contained melodrama in which each detail falls into place. The last part, A Time for Youth, is set in today's Taipei. It shows the city as a hotspot, supported by the calming music of Lim Giong. This music and his mood will also be presented live by VJ Sunny Hu at the festival. The middle section, A Time for Freedom, is set furthest in the past and could be described as the tour de force of the three. It is set at the beginning of the 20th century, during the occupation of Taiwan by Japan. It has the style of a silent film from that period. Not entirely planned: the real reason was that the actors had trouble speaking classic Mandarin. Another blessing in disguise.